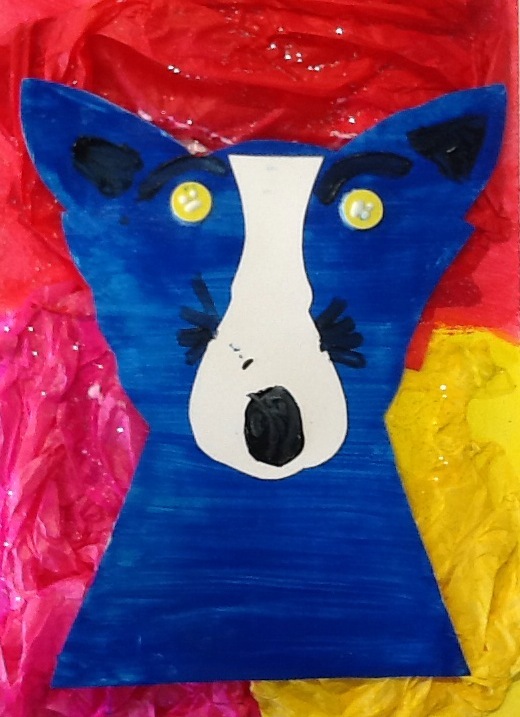 From New Iberia, Louisiana, George Rodrigue is known for his Blue-Dog series, inspired by his long-deceased childhood pet, Tiffany, whom he poses with other animals and people. He had early art talent, and ill for nearly a year, he used watercolors and crayons to pass the time and this activity set his future. He studied at the University of Southwestern Louisiana and in Los Angles at the Art Center College of Design. For a while he painted Abstract Expressionist works but then went back to painting that which reflected his own Cajun culture including folk tales and bayou and swamp landscapes. Adding texture with tissue paper. Wet on wet brush strokes. Have students start by painting their background. Explain how to divide the page bottom half into 2 quarters (right side yellow and left side pink and then top half is red). Begin painting with the yellow tempera (telling them that the tissue will stick with a good base of paint) and then adhering yellow tissue paper and painting over it. Do the same for pink and red. Then add silver sprinkles and set aside. Paint the blue dog body with blue paint (add the gloss if you want it shiny) next stick the nose template on and talk about how to paint it with black by doing a circular move at the end of the nose. Finally have students use small brush to paint the whiskers, eyebrows and ears black (I talk about the ear shape being a triangle) to assist them. Finally glue the eyes and body of the dog to the background and you are finished. It’s hard to find your posts in google. I found it on 12 spot, you should build quality backlinks , it will help you to get more visitors. thanks Sheena…still learning how to navigate the blog stuff 🙂 Going to Blogher so hopefully I will learn some more. thanks for reading and helping.